I think the inversion was already there, and is something done by the hangouts app itself, on purpose. The rotation clearly is a recent regression though. 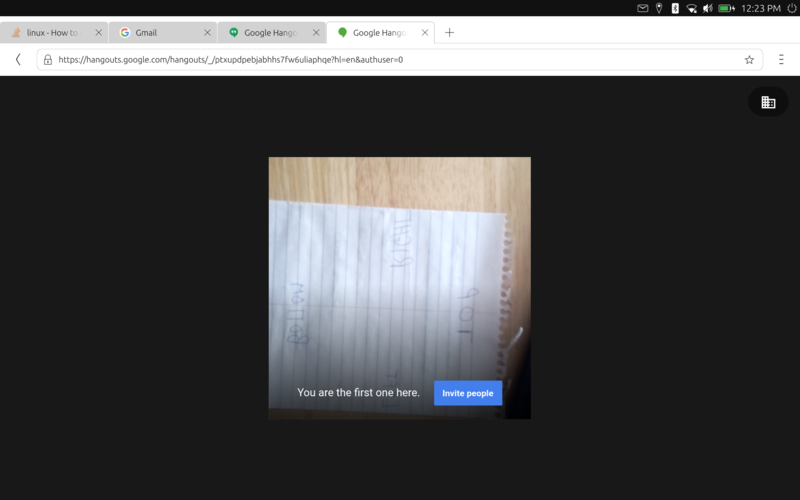 Yes, the hangouts app mirrors the camera preview - the actual image sent to other parties is not mirrored. "The orientation of the camera image. The value is the angle that the camera image needs to be rotated clockwise so it shows correctly on the display in its natural orientation"
In order to do this, we need to know the rotation of the device, which we calculate using the current device orientation referenced to its native orientation. In this case, the native orientation is incorrect - QScreen::nativeOrientation returns portrait. It should be landscape for the M10 (and other tablets). Not sure if its a directly related issue but the E5 image is upside down, which also used to work correctly. Obviously something regressed. If that doesn't sound related I can open a new bug. vegetahd probably has the same issue as krillin (bug 1567542), which is actually a device bug. I haven't got one of those though. See how the LVDS output (to the lcd) has width 1200 and height 1920. QtUbuntu relies on these values to guess the native orientation of the display. But it has no idea the panel is actually mounted 90degrees. I believe the graphics driver rotates the actual display too, further confusing things. Unless we've a way to determine the rotation of the lcd in the housing, I suspect we'll need a per-device quirk to make sure qtubuntu or mir returns the display dimensions we actually want. This was worked around in oxide with https://git.launchpad.net/oxide/commit/?id=2e5f300fbce422b648377a30fc633d8edb2fb638. And that fix was backported in the 1.16 branch: https://git.launchpad.net/oxide/commit/?id=0a98ec8a6474bde096465555477a4c1418fc760f.